This modern home is the second collaboration between a celebrated furniture designer and Lionel Morrison, an award-winning architect. The progression of materials and technology in this contemporary home make a floor plan similar to the first home even more graceful, sleek, and serene. A pedestal system supports the pool and 30’ x 60’ black granite slab terrace that continue to the living areas to make the entire surfaces from the water in the pool, terrace, and interior, level as a pool table. 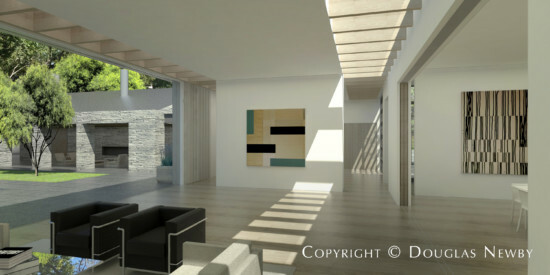 A 30’ wide by 12’ tall opening from the living room to the exterior courtyard can be opened and closed by pocket doors. Pocket screens of a similar size can be opened to reveal a dining room that seats 24 when dinner is ready to be served. This large modern estate has open views across the gardens in both directions and sunlight pours in from three different directions. This modern home is found in the Preston Hollow neighborhood.